"In my field, there is a heavy focus on how stressful events in our lives wear down our bodies and minds, with little focus on whether these effects can be stopped or even reversed. I found this to be scary at first, since stress is ubiquitous and since some people experience continuous and repeated stress throughout their lives. I knew the literature on exercise and all its wonderful benefits to the heart, brain, and entire body, and wanted to start looking deeper into whether exercise plays a role in supporting biological resiliency in individuals with high levels of stress in their lives." What is the connection between cultivating resiliency and leading a healthy lifestyle? "Life doesn’t always go our way. We can’t control the events that occur in our lives, nor can we always be eating the best way possible or exercising as often as we’d like to. In fact, when stressful events occur in our lives, our healthy lifestyle is often what falls to the side first. But these are the times that we must be our most conscientious to remain healthy. Our healthy lifestyle becomes one of many ways that we can remain resilient in the face of stress." If you could give parents, teachers and other adults one piece of advice about something they can do to help promote healthy living for both the mind and body, what would it be? "It’s the most boring of all advice: Be realistic about what you can and cannot do. Many people set brave, yet sometimes unrealistic, goals for becoming active, like going from little amounts of walking and no exercise per week to wanting to start working out 5 times per week for an hour each time at a very vigorous level at a gym that’s 30 minutes away. Most people do not succeed at such a drastic change and the only person benefiting is the owner of the fitness centre from the one year contract just sold. And here’s the less boring advice: Do something you enjoy to be active. If you don’t like the gym, stop forcing yourself to go to the gym. Find a diversity of activities that make you happy, that make you want to do it again, because that’s what will make you do it again!" 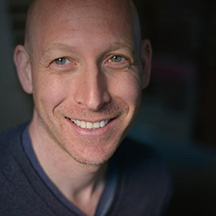 Hear Dr. Puterman's practical strategies for stress relief and discover how our physiology is inextricably linked to our well-being at Heart-Mind 2016. Dr. Puterman will be a keynote presenter on the afternoon of Friday, October 21, and will also be host of a Big Conversation/Small Group session on Saturday, October 22.